We kick off our 12 Months of Birding at the Inn series for 2016 with a favorite bird of ours: the Brown Thrasher. With its striking yellow(!) eyes, white chest speckled brown and noticeable singing voice, this bold bird really makes an impact. richer, fuller, and definitely more melodious than that of polyglottis” (the Northern Mockingbird). When looking for a Brown Thrasher at the Inn on Mill Creek, keep an ear out for the singing on high tree branches, but also pay attention to noise on the ground. Even though they’re fairly elusive, they do like to rummage through foliage on the ground in search of their favorite meal (insects) and we often spot them around the bushes near the birdfeeders as well as on the north side of the property near the Oak Leaf Room, where there is a nice bit of dense vegetation, including rhododendron and mountain laurel thickets. 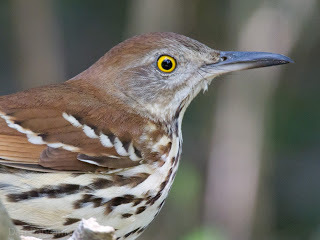 Something interesting that we learned about the Brown Thrasher is that this bird migrates at night, and also, they’re short-distance migrators. The ones who live in the northern part of their range (the northern part of the U.S., west of the Rockies, and the northeastern U.S.) migrate to the southern part of their range (the southeastern U.S.), where the year-rounders reside. We see them pretty much year-round, so we consider the Brown Thrasher part of our full-time forest crew. Stay tuned to our monthly bird list…February’s bird is quite a gem! This entry was posted in Birding in the North Carolina Mountains, Wildlife and tagged 12 Months of Birding at the Inn, birding by Inn on Mill Creek. Bookmark the permalink. One of these guys has been coming to my suet feeder! I am located in the Annapoli MD area near the Chesapeake Bay. I will start a bird album on flickr soon.